In stock -This product will ship today if ordered within the next 9 hours and 57 minutes. 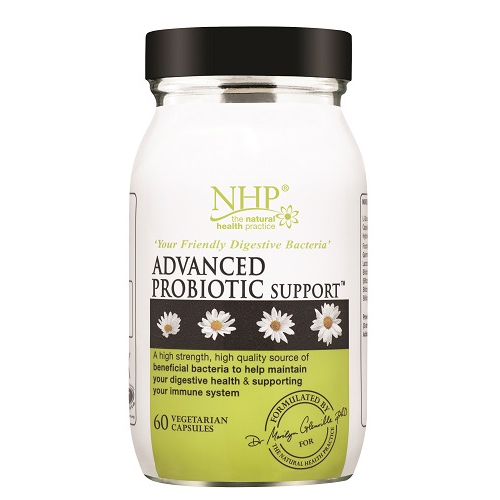 The Natural Health Practice Advanced Probiotic Support is a high strength and quality source of beneficial bacteria for balancing your digestive health and supporting your immune system. This supplement gives you 22 billion beneficial bacteria including 12 billion bifidobacteria and 10 billion lactobacillus acidophilus organisms. It contains added prebiotics to feed the beneficial bacteria, gamma oryzanol for digestive comfort and glutamine, the most important amino acid for healthy gastrointestinal function. There is no need to refrigerate as the beneficial bacteria are freeze dried and are activated after you have swallowed them, so brilliant when travelling. 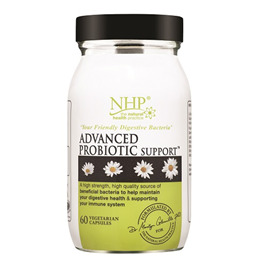 Advanced Probiotic Support is not a liquid so no preservatives are needed. This product is Kosher certified. L-Glutamine, Fructooligosaccharides , Lactobacillus acidophilus, Bifidobacteria, (Bifidobacterium breve, Bifidobacterium Longum, Bifidobacterium Infantis), Bifidus Bacteria, Lactobacillus Acidophilus, Gamma Oryzanol, Capsule Shell: Hydroxypropyl Methylcellulose. For best results take 1-2 capsules, daily, between meals and away from food, or as professionally directed. Below are reviews of Natural Health Practice Advanced Probiotic Support by bodykind customers. If you have tried this product we'd love to hear what you think so please leave a review.